The Jurassic is an important period in our understanding of many vertebrate lineages, since it saw the initial radiation of numerous important groups, including some of the clades that represent a large part of modern vertebrate biodiversity. One of these clades are the archosaurs, in which not only the dinosaurs and pterosaurs experienced their most important radiations, but also the origin of modern crocodiles and birds took place during this time. However, our understanding of Jurassic archosaur evolution is almost entirely based on the fossil record of the Northern Hemisphere, making it almost impossible to evaluate in how far the patterns seen there represent general patterns of aerchosaur evolution, or the effect that the initial break-up of the supercontinent of Pangea might have had on these evolutionary events. In South America, Jurassic terrestrial vertebrates are known only from very few localities, and most have yielded only isolated and fragmentary remains. Chubut Province, Argentina, has some of the best Jurassic geological units known from this continent, especially the latest Early to early Middle Jurassic Cañadón Asfalto and the Late Jurassic Cañadón Calcáreo Formations. 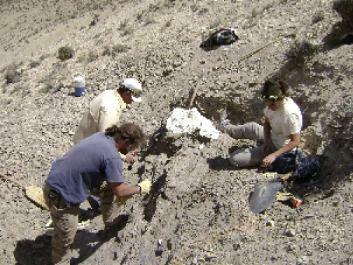 In collaboration with the Museo Paleontológico Egidio Feruglio in Trelew, Chubut, Oliver has been carrying out intensive fieldwork in these units since 2000. Currently, we are working in a large international colaboration with numerous Argentinean and some US colleagues on the geology and palaeontology of these two formations, a work that has already resulted in many new insights into Gondwanan Jurassic vertebrate faunas and their evolutionary and biogeographic implications. Becerra, M.G., Pol,D., Marsicano, C.A., Rauhut, O.W.M. 2014. The dentition of Manidens condorensis (Ornithischia; Heterodontosuridae) from the Jurassic Cañadón Asfalto Formation of Patagonia: morphology, heterdonty and the use of statistical methods for identifying isolated teeth. Historical Biology 26: 480-492. Pol, D., Rauhut, O.W.M., Lecuona, A., Leardi, J.M., Xu, X., Clark, J.M. 2013. A new fossil from the Jurassic of Patagonia reveals the early basicranial evolution and the origins of Crocodyliformes. Biological Reviews 88(4): 862-872. López-Arbarello, A., Sferco, E. and Rauhut, O.W.M. 2013. A new genus of coccolepidid fishes (Actinopterygii, Chondrostei) from the continental Jurassic of Patagonia. Palaeontologia electronica 16 (1): 1-23. Pol, D., Rauhut, O.W.M. 2012. A Middle Jurassic abelisaurid from Patagonia and the early diversification of theropod dinosaurs. Proceedings of the Royal Society B 279: 3170-3175. Carballido, J.L., Rauhut, O.W.M., Pol, D., Salgado, L. 2011. Osteology and phylogenetic relationships of Tehuelchesaurus benitezii (Dinosauria, Sauropoda) from the Upper Jurassic of Patagonia. Zoological Journal of the Linnean Society 163: 605-662. Pol, D., Rauhut, O.W.M., Becerra, M. 2011. A Middle Jurassic heterodontosaurid dinosaur from Patagonia and the evolution of heterodontosaurids. Naturwissenschaften 98: 369-379. Rauhut, O.W.M., López-Arbarello, A. 2008. Archosaur evolution during the Jurassic: a southern perspective. Revista de la Asociación Geológica Argentina 63(4): 557-585. Volkheimer, W., Rauhut, O.W.M., Quattrocchio, M.E., Martinez, M.A. 2008. Jurassic paleoclimates in Argentina, a review. Revista de la Asociación Geológica Argentina 63(4): 547- 554. Rauhut, O.W.M. 2007. A fragmentary theropod skull from the Middle Jurassic of Patagonia. Ameghiniana 44(2): 479-483. Rauhut, O.W.M. 2006. A brachiosaurid sauropod from the Late Jurassic Cañadón Calcáreo Formation of Chubut, Argentina. Fossil Record 9: 226-237. Martin, T., O.W.M. Rauhut. 2005. Mandibular anatomy of Asfaltomylos patagonicus (Australosphenida, Mammalia) and its implication for the evolution of the tribosphenic dentition. Journal of Vertebrate Paleontology 25: 414-425. Rauhut, O.W.M. 2005. Osteology and relationships of a new theropod dinosaur from the Middle Jurassic of Patagonia. Palaeontology 48: 87-110. Rauhut, O.W.M., K. Remes, R. Fechner, G. Cladera, P. Puerta 2005. 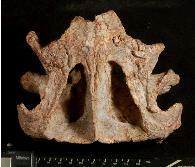 Discovery of a short-necked sauropod dinosaur from the Late Jurassic of Patagonia. Nature 435: 670-672. Rauhut, O.W.M. 2004. Braincase structure of the Middle Jurassic theropod dinosaur Piatnitzkysaurus. Canadian Journal of Earth Sciences 41: 1109-1122. Rauhut, O.W.M. 2003. A dentary of Patagosaurus (Sauropoda) from the Middle Jurassic of Patagonia. Ameghiniana 40 (3): 425-432. Rauhut, O.W.M. 2003. Revision of Amygdalodon patagonicus Cabrera, 1947 (Dinosauria: Sauropoda). Mitteilungen aus dem Museum für Naturkunde in Berlin, Geowissenschaftliche Reihe 6: 173-181. Rauhut, O.W.M., Martin, T., Ortiz-Jaureguizar, E. and Puerta, P. 2002: A Jurassic mammal from South America. Nature 416: 165-168. Sauropod dinosaurs represent one of the most important components of Mesozoic terrestrial vertebrate faunas, yet their early evolution and diversification in the Jurassic is still poorly understood. Furthermore, most of the pertinent data so far comes from Early and Middle Jurassic rocks in eastern Asia. The only abundant basal sauropod material reported from the Western Hemisphere so far comes from the Middle Jurassic Cañadón Asfalto Formation of Chubut province, Argentina, from where two species, Patagosaurus fariasi and Volkheimeria chubutensis, have been described. Especially the first of these taxa has figured prominently in basal sauropod phylogenies. However, recent research suggests that more sauropods are represented in the original material referred to this species, and intensive fieldwork in the rocks that have yielded these materials has resulted in the recovery of a wealth of new material. Thus, the objective of this project is a revision of the original materials of Patagosaurus and Volkheimeria as well as an incorporation of new materials. The alpha taxonomy of the sauropods from the Cañadón Asfalto Formation will be established, detailed osteological descriptions of the different taxa provided and their significance for our understanding of early sauropod evolution will be evaluated.